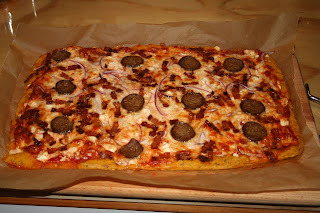 Hubby and I love pizza, and that has developed into a new desire to experiment with crusts, sauces and toppings. This weekend we had our new favorite: sweet potato herb crust. When I conceived of the idea, I did a search online for existing recipes and found very little to go on. The crust is not what I am used to (ball of smooth yeast dough that rolls out into a beautiful crust), but is very moist, almost like a thick batter consistency, that I spread on the parchment. I debated on blind baking it, but I decided that a soft, chewy crust might carry the flavor better. I am still tweaking the recipe (and working on the yeast version as well), but for now, I can give you a an idea of what I am doing. So far, everyone who has been at the house to try it has liked the light sweetness of the crust, balanced by the salt of the bacon. I have also substituted grated zucchini for the sweet potato puree, and it makes a beautiful green crust. My Aunt visited, and she really wanted to try this after hearing about it during one of our frequent phone calls. Fortunately, our friends at Nature's Garden Delivered had sent some sweet potatoes the week before (have I mentioned that I love them?). We made the pizza, and she not only wanted seconds, she wants the recipe. I'll always smile when I make sweet potato crust, and think of that day. sweet crust, and bacon is the perfect accent. I hope you experiment with this crust, and that you enjoy it even half as much as we do. I will share the tomato topping first, but keep in mind that you can use your favorite sauce, if you prefer. Also, if you like salty food, you may want to add salt to the tomato topping. I tend to use very little salt, believing that everyone can add it later to their own taste. Place the tomato quarters in the oven (a toaster oven is ideal here, I usually use a pie dish for tasks like this, but any baking dish will do) at 300° (I like a slow roast) until the tomatoes are tender. Remove tomatoes from the oven and allow to cool, remove the skins and dice finely. Mix tomatoes, minced onions, and herbs into something resembling a fresh salsa. Set aside to allow the flavors to develop. This could be made the night before and refrigerated. • salt to taste- I have recently begun to add app. 1 tsp of salt to this crust. Preheat oven to 400°F (app. 205°C*) In a large bowl, mix sweet potato, flour, spices, water and oil. This will make a very soft dough. Mix thoroughly, then spread on one or two parchment-lined baking sheets (depending on desired thickness). At this point I usually oil my hands and spread the dough, or you could use an oiled silicone spatula. Top with tomato mixture, shredded mozzarella, and toppings of choice (I strongly recommend bacon be included, since the salt of the bacon brings out the sweet, earthy flavor of the sweet potatoes. Bake for 15 minutes, or until crust is lightly browned on the bottom and cheese is melted. Again this is a soft crust, but the flavor is much better if you leave it so. 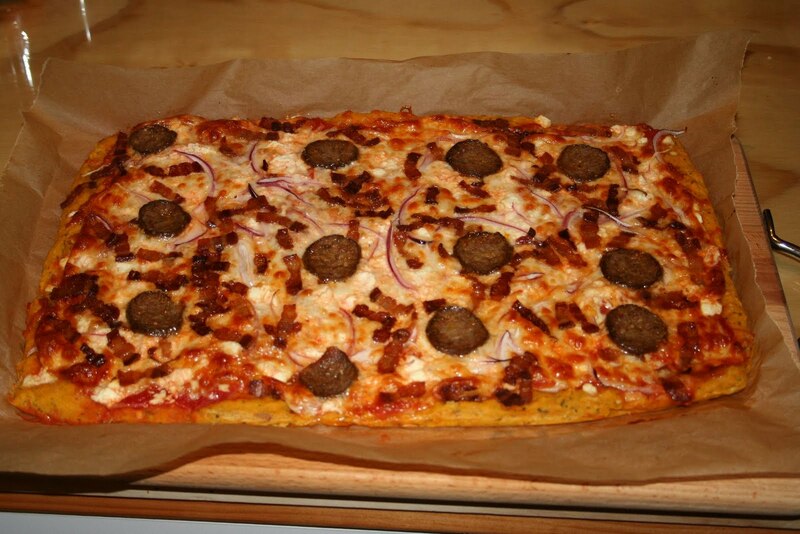 We crisped one of our pizzas, but the flavor disappeared. The consensus between my aunt, Hubby, and me was that as much as we imagined we would like the crispy, we preferred the soft. Oh, by the way, leftovers reheat beautifully in a low-temp toaster oven. HA, I see I commented a while back! I bet I had it on favorites then the comp crashed.... Time for Pinterest :) He so loves sweet potatoes, your bacon idea totally rocks this crust! !